I’ve always considered myself to be a tea drinker. With an incredibly British grandmother and a relatively British mother, I don’t think I ever had a choice in the matter. Don’t get me wrong, I enjoy a good coffee, but I see it as something that lights up the nerve endings in my brain in the morning. It enables me to face the day in something other than an incoherent zombie-like state. But tea? To me it is the ultimate comfort drink. It’s an old friend that warms the body and soul and always cures what ails you. Apocalypse? Tea…with a shot of rum. I once read a story about a woman who was shot in the head in her home. Miraculously, she was hit at such an angle that she was able to make herself a cup of tea whilst waiting for the police. I was always horrified by this prospect. Not due to the brutality of the crime, but because I knew that this is exactly what the women of my family would do, including me. I adore Earl Grey in particular. Nothing makes me happier than writing my blog whilst sipping on that wonderfully scented brew. For those who haven’t had the pleasure of trying it, Earl Grey is an intoxicating blend of black tea infused with the oil of bergamot, an Italian orange. It gives it a lovely zesty aroma and taste that I find enchanting. Unfortunately, not everyone shares my correct opinion. I have heard my beloved Earl Grey described as tasting like dirty dish water mixed with detergent by the boyfriend some. Well to him those people I quite intelligently retort – Your face tastes like dirty dish water mixed with detergent. Yeah, take that. So, who was Earl Grey and why on earth did he have a tea named after him? True to form, there are conflicting historical tales. 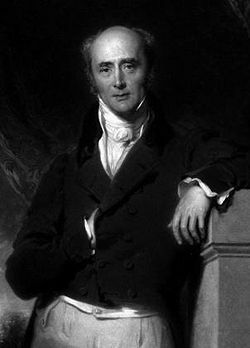 Charles Grey was the 2nd Earl of Grey and British Prime Minister between 1930 and 1834. He is still renowned for being one of the primary architects of the 1832 Reform Act. This act introduced a wide range of beneficial changes to the electoral systems in England and Wales. The Grey family state that the tea was specially blended by a Chinese Mandarin for the Earl. Legend has it that it was made with bergamot oil to compliment the water on the Earl’s estate, which is said to have had a hint of lime to it. Some believe that in 1803 one of the Earl’s men saved the aforementioned Mandarin’s son from drowning. He then showed his appreciation by presenting the Earl with the tea as a gift. However, bergamot oil wasn’t present in China at the time, and nor was the Earl. A far more likely story is that the Earl was presented with the tea by an envoy upon returning from a routine trip to China. The belief in this origin story is universal, unless of you ask Twinings. Their website claims that they themselves developed it and named it after the Earl. Conveniently enough there is no explanation as to why. Every historian knows that it’s those who hold power that decide what version of history will be considered as truth, and this is no different, albeit on quite a small scale. The tea rose in popularity due to Lady Grey, as she often used it to entertain guests in London. Others wished to purchase the tea and this is where Twinings most definitely became involved. They began mass producing the tea on a large scale and it quickly became a household name. Unfortunately for the Greys, they didn’t have the forethought to register the trademark. Subsequently, neither they nor their ancestors received any royalties from the sales of Earl or Lady Grey tea. For those who haven’t heard of Lady Grey, it was developed by Twinings and named after Lady Elizabeth Grey. It is far more delicate and fragrant than her husband’s counterpart. In addition to the bergamot oil, it contains both lemon and orange peel. I find it to have quite a flowery aroma and a very sweet taste. Earl Grey has remained popular throughout the years and is used quite often in cooking and baking. I’ve personally tried Earl Grey flavoured macaroons and chocolate and they were both delicious. I’d like to thank the lovely Katie for requesting this topic. As a result, I have decided to not only write about other teas, but to start an entire series on High Tea. I’ll most likely roll this out in September so it will coincide with one of Habitat for Humanity’s annual events – High Tea for Habitat. It’s a fantastic and delicious way to raise money for a great cause. I urge you all to get a group together and participate. More info can be found at http://www.habitat.org.au/hightea. Please leave a comment if you have a favourite tea that you would like me to explore the origins of. I absolutely love taking requests. Yes mum, I will definitely write about Russian Caravan for you. So we’re onto our last cocktail of the night, and everybody who is still conscious has agreed that it will be much easier to just stay up. Besides, it’s only three hours until they can go and get pancakes for breakfast! Everyone’s getting sleepy though, so it’s time for some caffeine. Alcoholic caffeine. Fact: Anything can be improved by adding copious amounts of alcohol and cream. For example – steak, pain medication, tax time. Between 1939 and 1945 many Americans flew to Ireland in a Pan Am Flying Boat. This extraordinary sounding aircraft was actually just a seaplane that contained a hull. Why not make a few extra bucks by storing passengers there? The planes would land in Foynes, Limerick after what I imagine would be a gruelling eighteen hour flight. After landing, the passengers would be shuttled by boat to the terminal. On cold days, the passengers would often be chilled and miserable after the ride. As such, they greatly appreciated a cup of hot coffee or tea upon arrival at the terminal. The Irish have taken whiskey in their tea for many centuries and this gave the chef at the airport restaurant an idea. He thought he would provide the freezing passengers with a little Irish hospitality with an American twist. He knew of their partiality to coffee with cream, so he added some whisky to the cups. One of the pleasantly surprised passengers asked “Is this Brazilian coffee?”, “No” replied the chef, “That’s Irish coffee.” And thus the original Irish Coffee recipe, as well as another excuse to drink, was born. Ten years later, the owner of a San Franciscan restaurant decided to recreate the alcohol laced coffee that a friend had tasted in Ireland.They thought it would be a simple process, but after many experiments using a variety of whiskey they weren’t satisfied. It didn’t taste the same and the cream always sank to the bottom. Being persistent, the pair travelled to the Limerick to sample the original. When they returned, it was decided that only high quality Irish whiskey could provide the proper taste. Furthermore, the cream had to be slightly aged and lightly whipped. 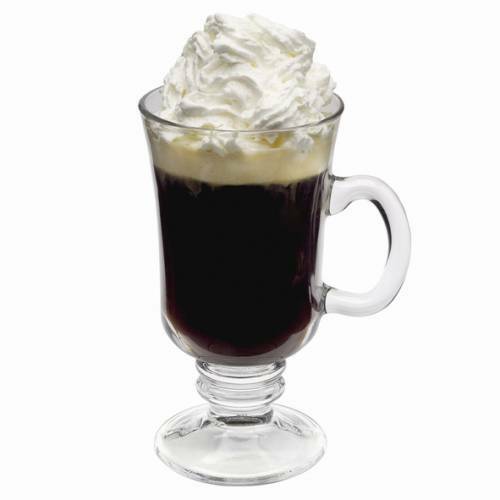 Voilà, Irish Coffee crosses the Atlantic and began to grow in popularity throughout the United States and the world. Now, in case you have the uncontrollable urge to get boozed up over your morning/afternoon/evening coffee, here’s a recipe! Heat the coffee, whiskey and sugar on a medium heat. Do not boil. Pour into a glass and top with cream. Serve hot. Now, I realise that I began this post by saying that this was the last cocktail of the night. However, I never said that we wouldn’t be indulging in one in the morning. I wonder what it will be? Check back tomorrow to find out what delightful concoction we’ll be finishing our cocktail party with!